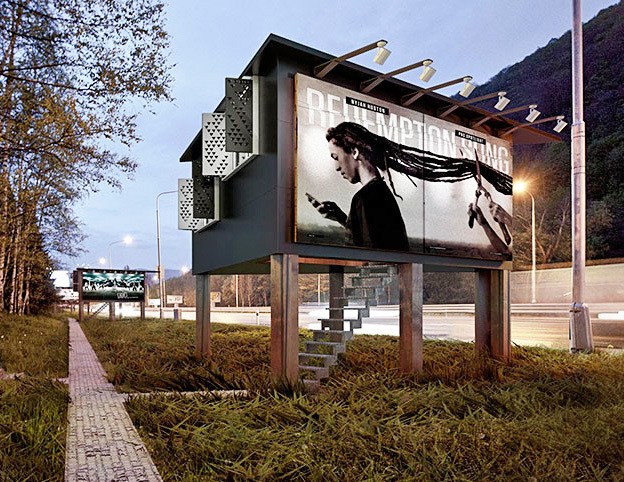 Slovakian firm Design Develop has come up with an innovative solution to provide shelter for the homeless: billboards. 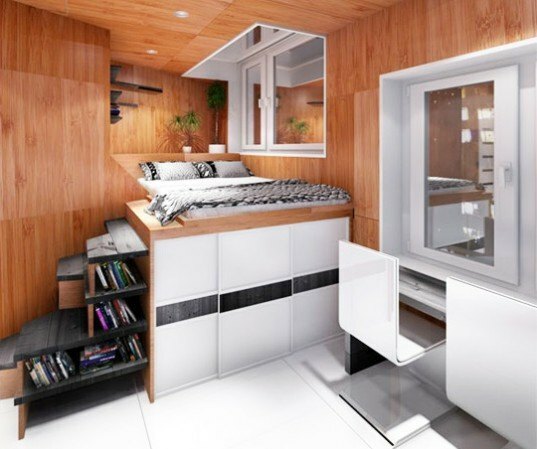 Project Gregory is a compact, triangular dwelling that could be funded in part by the proceeds of selling advertising space on its exterior walls. Homelessness is a complex global issue, and finding solutions involves the coordination of many fields and services. Project Gregory seeks to provide alternative dwellings for the homeless that double as billboards and advertising spaces. Billboards are expensive to install, maintain and rent, and Project Gregory optimizes the structures so that they can double as living spaces. To fit out the structure, the billboard dimensions are preserved, and a set of steps are added. The interior floor plan is informed by the resulting triangular shape. The interior is divided into two rooms, the first containing an entrance hall, a kitchen with a small office desk, and a raised bed set above a storage space. The second room contains the bathroom, with a washbasin located over a wardrobe, a toilet, and a shower corner. The structure consists of a wood frame with a concrete base, with impregnated OSB board facing, wooden or steel stairs, and two windows. Project Gregory is designed for the city of Banska Bystrica, Slovakia, where the project would be easy to implement thanks to existing energy and water grids. The designers believe the billboard housing project could be applied elsewhere though, as long as adequate study and consultation was carried out beforehand. The project would be funded by firms and investors that could help with construction or acquire long-term rental of the advertising space. The Project Gregory website states that it is a nonprofit platform and is freely available for cities to implement free of charge. It’s designed as an “open source” project, so architects, designers, and artists can build upon it to create new designs and layouts. rckoegel: If we gave you a lemon what would you do with it? You laid out a prescription for the downside of the billboard that is a challenge that environmentalists already have solved. You make lemonade, this way, with the lemon. This Billboard has the economics, the social, educational and human aspects and them some all rolled into one sustainable solution. These are the brain freezes that make us go Why did I not think of THAT! The advertising revenues generated could be used, as a tax deduction to the company as an incentive plus the cost of building and maintaining the structures. The residents can work to maintain the roads and adjacent landscaped areas and get a stipend to create some form of employment. The downside is the environmental impact and the 'visual pollution' or noise. I LOVE IT Lets do this and engage artists to do outdoor works to complement the visual communication these installations offer. It also puts our poor, homeless, undesirable, and possibly more likely to commit suicide people within spiting distance of high speed roadways; and exposes them to higher concentrations to pollutants then other 'temporary' users of the same areas. Definitely a great idea in my book... says all Hitler wannabees. Homelessness is a complex global issue, and finding solutions involves the coordination of many fields and services. Project Gregory seeks to provide alternative dwellings for the homeless that double as billboards and advertising spaces. Billboards are expensive to install, maintain and rent, and Project Gregory optimizes the structures so that they can double as living spaces. To fit out the structure, the billboard dimensions are preserved, and a set of steps are added. The interior floor plan is informed by the resulting triangular shape. The interior is divided into two rooms, the first containing an entrance hall, a kitchen with a small office desk, and a raised bed set above a storage space. The second room contains the bathroom, with a washbasin located over a wardrobe, a toilet, and a shower corner. The structure consists of a wood frame with a concrete base, with impregnated OSB board facing, wooden or steel stairs, and two windows. The Project Gregory website states that it is a nonprofit platform and is freely available for cities to implement free of charge. It's designed as an "open source" project, so architects, designers, and artists can build upon it to create new designs and layouts.